The summer vegetables have now arrived with abundance. Summer Purple Sprouting is always very popular and this is certainly cropping well. Unfortunately, with the recent hot weather, nobody seems very keen on cooking, hardly surprising, preferring to opt for salads instead! 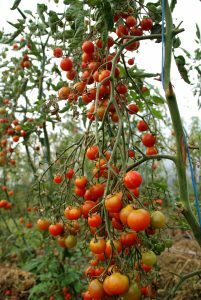 The tomatoes are ripening in the tunnels on a daily basis and are certainly sweet and juicy and full of flavour. We have grown ‘Super Sweet 100’ this year which is proving to be very popular, as are the slightly more traditional ‘Sun Gold’. Lettuce are looking good as well with plenty of variety and our salad bags are also popular. We finally finished planting out the last of the brassicas last week, around 4,000 kale plants, together with the last of the leeks. The early leeks which were transplanted are looking good and we’re sure that it won’t be long before we can start to harvest. A little rain would not go amiss, but I expect this won’t be popular with some! The French Beans which were planted early in the tunnels have cropped very well, but we will be taking these out shortly, with the beans in the field now being available for picking. The only crop which does look rather sad is the squash, we planted out beautiful healthy plants but unfortunately it appears that they didn’t like this year’s weather. We have a few which have survived, just hope that some of the others pick up soon.